My recent trip to Earthbound Farm — with a group of wonderful bloggers including An Edible Mosiac, one hungry momma, Blender Girl, and Deliciously Organic — was a wonderful eye opener into the world of how my favorite salad mixes are raised and harvested. The stunning farmlands are located near San Juan Bautista, California, with a beautiful mountain backdrop that makes you wonder if you’ve missed your calling, living off the land as a cowboy or cowgirl. 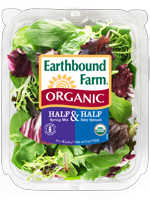 Earthbound Farm is America’s largest grower of organic produce — you know the ones — the pre-washed, packaged salad greens that are ever-present in my fridge! Upon arrival we were met by Myra Goodman (a transplant from Manhattan!) and one of the founders who started the company with her husband Drew, back in 1984. 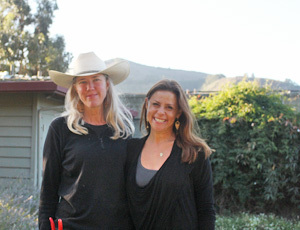 She and her husband are both deeply committed to the health of people and the land — their commitment to organic farming is what molded and shaped the Earthbound that we all love today. As the sun started to set, we were seated in a large outdoor pavilion, at their “farm stand” — no ordinal little roadside stop located in Carmel Valley — with a wonderful shop, kitchen, and impressive 2.5-acre backyard garden where they test and grow new vegetables varietals. Over an amazing dinner filled with deliciously dressed fresh greens, roasted curried vegetables and crispy roasted chicken (created by their chef, Sarah Lacasse) we chatted about cooking, blogging, our favorite herbal remedies, books, and Californian wine. Then it was off to bed, so we could all hit the farm tour first thing in the morning, rain or shine. 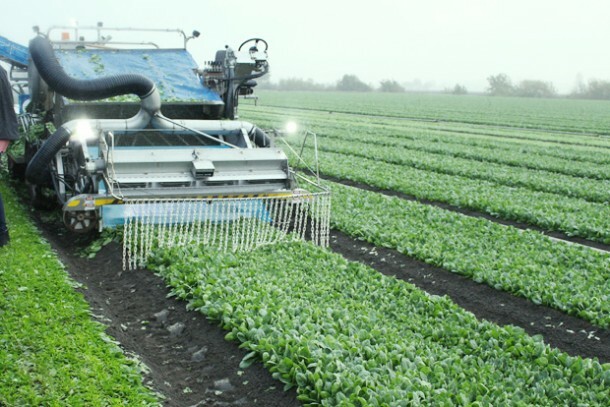 The first stop was a trip to the fields where we learned how tender baby spinach is harvested. The machine you see in the picture above it fitted with a “bandsaw-like” belt that rotates in a circular motion to thinly slice baby spinach leaves at their stem base so they do not get crushed or damaged, making them more hearty for travel and storage. See the plastic chains that hang down from the harvest machine? Well, those are called “ticklers” and they move beneficial bugs and other garden insects out of the way before the greens are harvested. 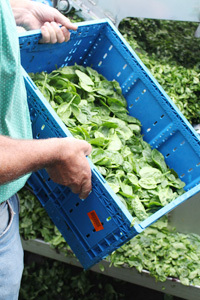 The greens then travel to the plant for washing and packaging before they are shipped out. Ever wondered why baby greens taste so good? Even after they are picked, they stay “alive” and continue to breath or “respire” for weeks to come if they are properly stored and packaged. During our visit to the Earthbound lab, we saw proof of this as one of their scientists showed us an astounding time-lapse video where bruised leaves where able to “heal” or plump up tears over a period of 8 to 10 hours. They do extensive testing on how greens survive shipping and packing process and had samples to show us the effects. I learned that greens must be packed with a tiny amount of water clinging to their leaves to keep them hydrated as they are sent on their way. Apparently kale has a tendency to respire more (meaning kale can wilt or spoil faster with too much oxygen), so the company devised a special packaging process with a thin film covering the baby kale and kale mixes to keep their leaves fresher, longer. Organic produce in the US is highly regulated, from the soil, to pesticides, water, and even how the plants are handled during washing and packing. Organic farming avoids practices like genetic engineering, pesticides, radiation, and using sewage sludge for fertilizer, along with other potentially hazardous fertilizers from non-organic sources. In the case of meat, producers are required to give livestock agricultural feed that is 100 percent organic. What I like best about organic, is that I know I’m getting a quality product that tastes great (and in most cases taste better!). I also know that it’s healthier for me, the land, and I don’t even have to think about GMOs since they are not permitted. So what does that mean for our bodies? It means we are consuming less hormones, antibiotics and pesticides. So how do they protect crops with all these rules in place? When it comes to controlling one of the most detrimental pests on the farm, aphids, the farmers came up with an ingenious non-caustic way to protect their crops. Apparently syrphid flies, the natural enemy of aphids, can save the day if you can get them to “hang” out around the crops. 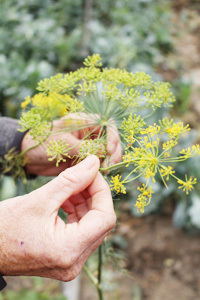 Farmers have learned to plant plenty of flowering plants, like this gorgeous flowering dill, to entice them into the fields where they can feast on plenty of aphids which can decimate tender growing greens. Looking to go organic and want to get the most for your buck? Salad greens, kale, and broccoli can be very budget-friendly, in some cases we’re taking 10 cents or up to $1 extra for the goodness of organic. This is especially true for organics that come from a large farm like Earthbound, since they are able to bring the costs down as they grow and sell more produce. At the end of the day, farmers want their produce to be affordable but it’s all about scalability while maintaining a high level of quality. When you look deeper into organic farming, it’s certainly a tough business. Not only are organic farmers faced with strict regulations but organic fertilizer costs double compared to conventional and the cost of labor is much, much higher. Organic farmers are prohibited from using dangerous pesticides that would rid them of pesky, hearty weeds that have to be plucked weekly by hand — that means teams of people weeding on a regular basis. But throughout my experience on the farm, all the tough work is done with a smile, a whole lot of love, and passion from people who really care.